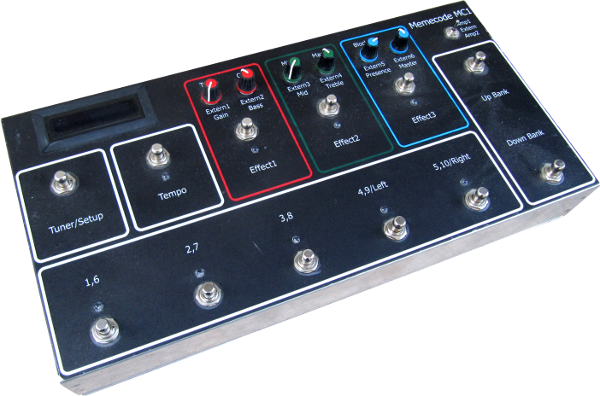 The Memecode Controller 1 (MC1) is a hardware and software kit to build a MIDI controller that primarily targets the Fractal Audio Axefx Standard and Ultra series of effects processors. The kit enables someone with a basic understanding of circuits and soldering to put together a controller that closely meets their needs in terms of layout and dimensions while also have some Axefx specific functionality like tuner display, the ability to send and receive Axefx sysex commands and display the current patch name. If they also have an understanding of programming languages (specifically C) then they could modify the firmware even further to achieve specific functionality. Display and selection of presets within 3 banks of 128 presets. Set and display current Axefx tempo. Display the current patch name. Send CC or Axefx set parameter messages based on controller position or IA state. Go into Axefx tuner mode, and display tuning information live as it streams from the Axefx. Allow basic grouping of mutually exclusive IA buttons. Direct access via knobs to the AMP1 and AMP2 blocks Gain/Bass/Mid/Treble/Presence/Master settings. 6 internal expression knobs and 2 external expression inputs for foot controllers. It's possible that other platforms can work, but that is a known good platform. The firmware source code is provided with the kit. It's written in fairly modular C code and compiles for both the hardware platform and as a virtual desktop software controller that runs on a normal PC or Mac. This allows you to test changes on a desktop computer without having to go through the cycle of building the firmware and flashing it down onto the AVR chip that runs the hardware version of the controller. The hardware platform is the ET-AVR stamp from Futurlec which is basically an 8-bit AVR processor running at 16mhz. Sections for each IA button that contain a variable number of commands. Each command can be configured to do Nothing, send a CC, turn an Axefx block on/off, change scene or send a sysex command. Configure grouping of mutually exclusive IA's. Sections for configuring the expression knob commands, split into "Normal", "Amp1" and "Amp2" modes. Each with 8 sets of commands, one for each expression input. Commands and their edit page are the same style as the preset IA ones. CC config for tuner and tempo messages. Software de-bouncing of buttons. Including a "held" down stage. The original run of PCB's is now sold out. However if you want to fabricate your own PCB and use the software you can buy just the firmware and source and build all the hardware yourself. In this case all the files will be distributed to you electronically and there is no physical product to ship.